How was last Christmas for you? Ours was strange, in that we had a newborn baby living in the crook of my arm, a two year old who was very excited about Santa but had cobbled together her expectations from (often conflicting) TV shows, and we had all spent the previous few weeks passing around particularly nasty bugs. Steve and I didn't have much energy but our eldest child had more than she could handle. A few days after Christmas, we sat down and talked about which bits of the festive season had worked for us and which had not. We had been trying to keep things very simple, what with the new baby and all, but had still experienced low level stress and dissatisfaction; we also felt that our eldest's season had been more manic than magic. So we talked seriously about where things had gone awry and what we could do differently in the future. The big thing, for Steve and me, was that we have different ideas of what Christmas is all about. For Steve, Christmas is about the cooking and consuming of an enormous meal with several courses and endless trimmings. He felt stressed because he still wanted to provide that, despite being in the midst of new baby chaos, and deflated when it didn't quite work out. For me, Christmas is about the family all being in the same room, playing together and watching feelgood films. I would happily eat nothing but chocolate coins and toast. 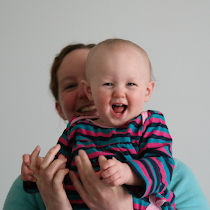 I felt frustrated because I didn't expect to do much solo parenting that day and couldn't understand why Steve was so keen to go off and hide in the kitchen (much as I do that several times a day, myself). So, this year we're going into Christmas more aware of each other's expectations, and better prepared to compromise. There will be less food, more of which just needs to be bunged in the oven and left, but I'll also be expecting Steve to vanish into the kitchen for part of the afternoon. Empty tummies lead to irritability. Food must be consumed before the presents are opened. Steve and I have never bothered with a Christmas tree - between small children, cats, lack of storage and general cynicism, it didn't really appeal. But last year our then-two year old kept asking us where our tree was and was visibly disappointed when we kept telling her we didn't have one. This year, we have bought a tree. A fake one, I'm afraid, for longevity and car-free simplicity. It's hidden away. We're going to put it up and wrap it in lights after the kids go to bed one evening (though we'll leave the decorations until our eldest is around to help) - I can hardly wait to see their little faces when they spot it in the morning! We quite like the "something they want, something they need, something to wear and something to read" idea, although we don't stick to those four categories (it's really hard to wrap "whatever my sister's playing with at this exact moment in time" and the kids don't appreciate clothing). We do stick to around four presents per child (they get the same quantity right now, because they're at an age when that matters) and try to have them all from slightly different categories ("something fluffy, a game, a sparkly thing, etc"). They each also get a stocking of trinkets "from Santa". The grandparents, on the other hand, went a bit completely and utterly over the top last year, to the point where our eldest didn't want to finish opening her presents because she was feeling so overwhelmed. She would have been happy with a couple of games. So, this year, we've asked them to either buy the kids one big present each or no more than four smaller gifts. We'd rather the gifts were well chosen than overwhelming. We've also asked that, if they're getting the kids any books, they put them all in one parcel with both kids' names on it, because we feel strongly that books are for sharing, not for allocating to children by age range. We've also asked that, if they're giving us any chocolate or alcohol, it be kept separate from the other presents so we can open it once the tiny scavengers have gone to sleep! As for ourselves, we're not bothering to give each other stockings this year as we don't need any more novelty tat. We used to agree a budget for each other's presents, but I would stick to it and Steve would blow it - one of us was doing it wrong (the jury's still out on which). This year we're just bearing the four gifts thing in mind. So that's what we're doing differently this year. I'm a firm believer in every part of Christmas being optional. The tree is optional; decorating your home is optional; cards are optional; gifts are optional; stockings are optional; advent calendars are optional; the meal is optional; the Bailey's is optional; the Queen's Speech is optional (I don't think I've ever seen it); the chocolate coins are optional (I'll have yours, if you don't want them); the work do is optional; the panto is optional; special pyjamas are optional; Christmas Eve boxes are optional; that creepy, manipulative elf is optional; Elf is optional, as is It's A Wonderful Life. You can skip whichever bits you want to. You can also make up your own traditions. If Christmas, to you, is all about eating baked potatoes with Super Noodles on top whilst watching Battlestar Galactica and wearing a unicorn onesie, you do your own thing. Make your perfect day. My only rules for Christmas are these: don't get into needless debt and don't cause yourself unnecessary stress. Are your traditions working for you?